As regular readers will know we are big fans of Google SketchUp here at digital urban. From its ability to export to game engines such as Unity through to its integration with Google Building Maker, SketchUp has become our one stop shop for urban modelling. To get the most out of SketchUp it is well worth sitting back and going through one of the many tutorial books and ‘SketchUp 7.1 for Architectural Visualization’ by Roben de Jongh is one of the best out there. Normally we are slightly skeptical about tutorial books, after all most tutorials can now be found online but Robin provides a unique step by step guide that provides an essential skill set. For example, Chapter 4 details how to model ridge tiles, that is not something your easily come across online and that alone makes the book a must buy. Chapter 1: Quickstart Tutorial – Photo Real Gallery Scene – This chapter is an immediate fix for those who are impatient to get photo-realistic rendered SketchUp scenes. Straight away you will learn how to model the gallery scene, fix up lighting, add materials, add a photo background, and finally render in Kerkythea. Chapter 2: Plug in and Gear Up – Did you know that by downloading a few free plugins and other software you can turn SketchUp into a free fully functional 3D visualization and animation suite similar to high end commercial software? Follow this chapter to obtain all the goodies. Chapter 3: Composing the Scene – In this chapter you will learn how to take the hard work out of modeling by setting up your scenes prior to starting work. You will learn how to start from CAD plans, site images, or Google Earth and build the scene optimized for quick rendering or animation later. 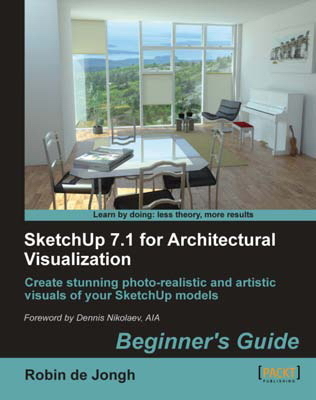 Chapter 4: Modeling for Visualization – SketchUp is so easy to use that we’re tempted to jump right in and model everything. But this can lead to ineffective presentation later and large polygon counts, which slow the computer. This chapter leads through some of the professional modeling methods you need to learn to save you time and hassle, and to make photo-real rendering a cinch. Chapter 5: Doing It Up (How to Apply Materials and Photo-textures) – Most visualizers are crazy enough to use the materials bundled with rendering software. But this methodology was developed during the ice age! Now that we all have digital cameras and access to unlimited free online image resources, we have a far more effective way of “dressing” the model. The tutorials in this chapter show you how to use SketchUp’s unique photo and material handling tools to create ultra-real textured models mega easily. Chapter 6: People, Trees, Furniture, and Things – Now that you’ve created the scene, modeled the buildings, and applied materials, you can add life to the scene with Entourage. Learn how to find the best free people, foliage, vehicles, and furniture online, and better still learn how to easily create your own with the foolproof methods in this chapter. In no time you’ll be able to build up a comprehensive library to use or give/sell to others. Chapter 7: Artistic Techniques – Exporting images from SketchUp is not the end of the process. Combining several image layers in GIMP, a powerful free photo editing suite, you will learn how to simulate sketchy pencil and watercolor styles. Fans of these methods will be pleased to know the famous Dennis Technique is presented in this chapter along with Dennis’s own creations. Chapter 8: Photo-realistic Rendering – Here the amazing Kerkythea introduced in Chapter 1 and 2 is explored in more depth, giving you the skills and confidence to tackle any rendering project. A hassle-free method of working is introduced along with proven best settings for test renders and final outdoor and indoor scenes. This chapter covers everything you need to get professional photo-realistic renders from your SketchUp model that you’ll be personally amazed with. Chapter 9: Image Compositing and After-effects – The rendering process isn’t the end of the line, because there are lots of subtle but important after-effects you can apply to make the image even more effective. This chapter covers how to add reflections without rendering, creating depth of field effects from a depth render, adjusting levels for realistic daylight scenes, and compositing real and rendered images. Chapter 10: Animated Flyovers and Walkthroughs – The crowning glory of your visualization project is likely to be a rendered or artistic-style animation. The tutorials in this chapter will take you through this step by step, showing you how to create storyboards, set up cameras and paths in SketchUp with extra plugin functionality, export test animations and final renders. Photo-real animations are then composited to make a simple show reel. Chapter 11: Combining It All in Layout – Layout is bundled as part of SketchUp Pro and is introduced in this final chapter for those who wish to explore the free trial before committing to Pro. You will learn how to bring together SketchUp models and artistic or rendered output into a screen presentation or printed portfolio, adding borders, text and dimensions. The good news is that the nice people at Packt Publishing have provided us with 3 copies to give away. All you need to do is retweet this post and we will pick 3 random twitter users by 12 Noon Monday 10th January, each will receive a copy of the book. The competition is open to anyone in the world, yep we will ship it out free of charge next week.